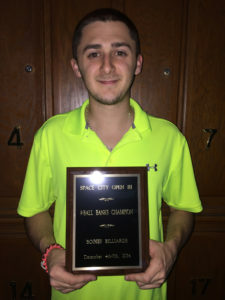 In its third run, the Space City Open proved even more successful this year drawing in nearly 130 players with an ever-increasing purse, topping off this year at $45,000.00. The amount of talent that encompassed this four-day billiard event was unsurpassed, a breathtaking demonstration of ability, enthralling countless fans and at-home viewers tuned in to the live stream broadcast provided by Zach Goldsmith and OnSitePool.tv. 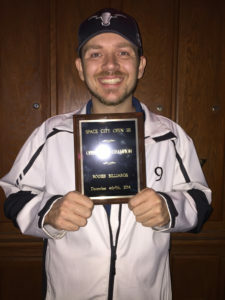 Austin player James Davis, Jr., “Junior”, captured his first Space City Open 9-Ball Division title besting area counterpart and billiard veteran Coy Lee Nicholson in the finals. 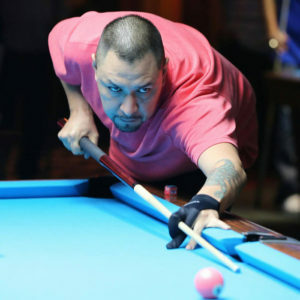 Manny Chau surprised many in the elite One Pocket Division stealing the title from former U.S. Open Champion, Jeremy “JJ” Jones, while young superstar Sky Woodward proved the “sky” really is the limit with a phenomenal win over James Davis, Jr. in the finals of the 9-Ball Banks Division. WPBA Players Vivian Villarreal, “Texas Tornado”, and Liz Lovely battled it out for their division title. Villarreal beat Lovely in overtime to take home her second women’s title. 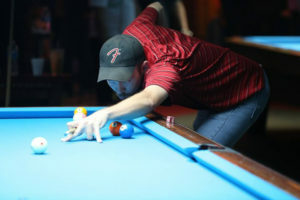 Flocks of fans and followers converged on Bogies Billiards & Sports Bar in Houston, Texas during the first week of December, knowing this is the time and place to watch the best in billiard competition. Just short of “gnashing of teeth”, players mean business at the Space City Open, and this makes for a great show. Players funneled in from as far as Des Moines, Iowa and Phoenix Arizona, in hopes of making their forever mark on Space City. All enjoyed unseasonably warm temperatures, the smell of slow smoked barbecue in the air, and plenty of shopping provided by this year’s vendors, Ron Geyer Cue Repair, Joe Salazar Connoisseur of Custom Cues, and Sean King with JB Cases. 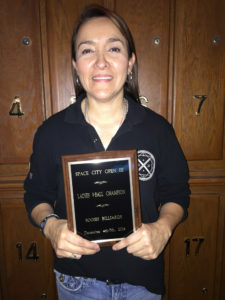 Businesses behind the brawn of this year’s Space City Open included David Richardson, owner of Bogies Billiards and Bogies West, Roger Schuett and the APA of North Harris County, Davis & Newsome, PC, Ozone Billiards, and Poison Billiards. Zach Goldsmith of OnSitePool.tv provided the impeccable 4-day live stream with commentating by “Lucky” Luke Sutliffe, and event photos were captured by Tim Smith and Eugene Lee Images. Thanks to Assistant Tournament Director Chuck Adams, the event ran smooth and on time. 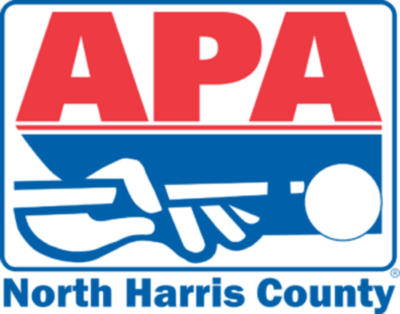 Keedra Manning and Mike Fabacher assisted with pre and post event activities and BCA Referee Derrell Montgomery of Conroe, Texas, made his third appearance, “keeping the peace” at this year’s event. “We have the best support system helping us make this event possible and we are deeply appreciative”, says Tournament Directors John and Kim Newsome. The caliber of play in the Space City Open 9-Ball Division rivaled any top, men’s event where one mistake can cost you the set. This division drew 108 players competing over two days for almost $24,000 in prize money. James Davis, Jr. and Coy Lee Nicholson weathered the storm to meet one another at the end of winners’ side while James Davis, Sr. “Bastrop” and Andy Jethwa fought through the one loss side. Along the way, Davis, Jr. defeated John Palmore, Danny Lee, 9-6, and Eric Brown, 9-7, while Jeremy Jones bested Chuck Adams, 9-7, Ernesto Bayaua, 9-8, and Robert Clark, 9-2. On the bottom side of the winners’ bracket, Nicholson dusted off Tony Scott, Joey Gray, 9-6, and Rick Moreno, 9-8, while Sky Woodward charged with wins over Joey Barnes, 9-5, Sylver Ochoa, 9-6, Jacob Watson, 9-5, and Rob Saez, 9-8. As the east side panned out, the one loss side became a viper pit. Bastrop won an astounding 10 consecutive matches after a first round loss to Bayaua. He struck down Alex Olinger, 7-6, C.J. Wiley, 7-4, and Joey Gray, 7-2, while Andy Jethwa took out Masahiro Nakahara, 7-6, Rick Moreno, 7-4, and Chase Rudder, 7-5. On the winners’ side, in surprise upsets, Davis Jr. overcame Jones, and Nicholson bested Woodward, pairing Bastrop with Woodward, and Jethwa against Jones on the one loss side. Young gun Davis Jr. went on to defeat the veteran Nicholson for the hot seat, 9-5. Woodward fell to the elder Bastrop, 7-4, while in an amazing display of skill and reserve, Jethwa shut out Jones, 7-0. In these final matches, the caliber of play was so intense, it wasn’t hard to fathom losing the flip and losing the set. Bastrop went on to defeat Jethwa, 7-4, but suffered a hill-hill heartbreaker to Nicholson, 7-6. Although both players seemed at the top of their game, Nicholson’s bid was short-lived as Davis Jr. secured the final set and his first-ever Space City Open title. The 46 player One Pocket field featured an all-star cast with phenomenal talent going head to head in a test of wills and stamina. Oklahoma’s Chip Compton made his way through the winners’ side with wins over Bob McFerren, Tim Kindl, and Chase Rudder, while Jeremy Jones defeated Ray Lopez and Arizona’s Tres Kane. Many Chau put his one pocket skills on display, besting Joey Barnes, Blaine Barcus, John Palmore, and finally Joey Gray to face off with Jones. Alex Olinger ousted Forest Boyd, Jason Chance, and Sylver Ochoa while sleeper Robert Clark dusted off Sky Woodward and James Davis, Sr. The final four pitted Jones and Chau on the top side, with Olinger and Clark on the bottom. 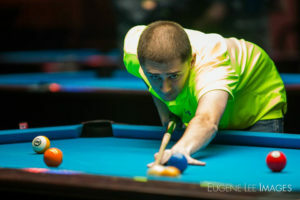 After suffering a 3-1 loss to Tony Barrington on the winners’ side, Rob Saez was stopped short by Davis, Sr., 3-1, while Woodward’s ticket was punched by Gray, leaving these two players in 7th-8th position. Back on the east side, Chau bested Jones and it was Clark over Olinger by the same score, 3-1. On the one loss side, Jones made quick work of Davis, Sr., 3-1, and Olinger eliminated Gray, 3-1. Chau shut out Clark for the hot seat, 3-0, while Jones made his way through Davis,Sr. and Olinger by the same score, 3-1. Jones squeezed by Clark, 3-2, but fell to Chau in the finals. 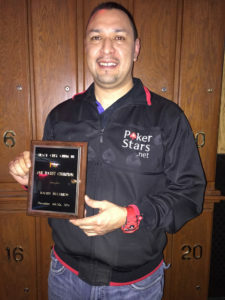 Chau went undefeated to earn his first, Space City Open One Pocket title. Kicking off Space City Open was Thursday’s 23-player, 9-ball banks division. Kentucky’s Sky Woodward won 4 consecutive, flawless matches shutting out Chris Thompson, Chris Lue, Tres Kane, and Chase Rudder, while James Davis, Jr. made his way to the hot seat with wins over Manny Chau, Joey Barnes, and Joey Gray, by the same score, 3-1. After a first round loss to Barnes, Jason Chance executed wins over Thompson, 3-2, Chau, 3-0, Mike Alonzo, 3-1, and Kane, 3-0, to meet Gray for 5th-6th. After an early 3-1 loss to Gray, Olinger eliminated Tom Mooney, 3-1, Barnes, 3-2, and Rudder, 3-0. Hot seat action saw Woodward lose his very first set in the banks division to Davis, Jr., 3-1. On the west side, Gray eliminated Olinger but fell to Woodward, 3-1. In the true, double elimination final, Woodward took command and revenge, besting Davis, Jr., 3-0, 3-0. 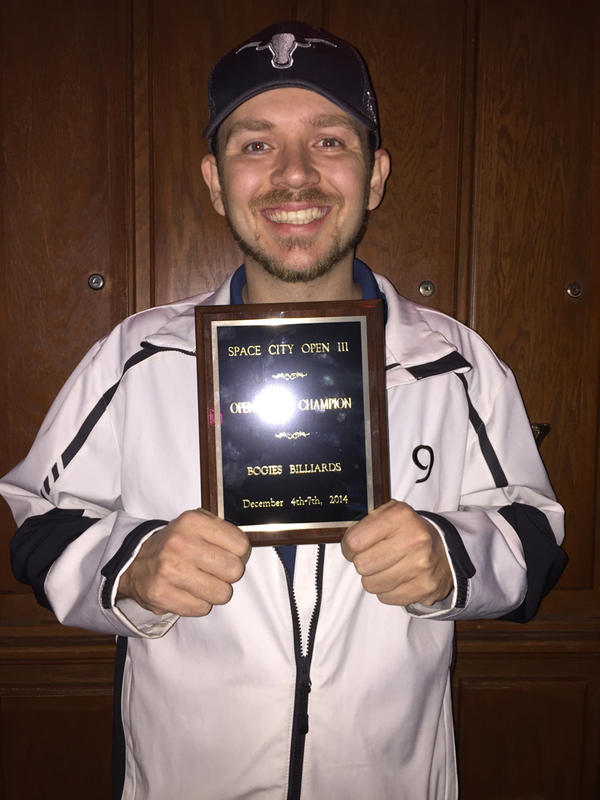 Woodward closed out this division losing a total of 2 games in 8 sets, taking home his first Space City Open title. Rounding out this billiard extravaganza, 18 women battled it out on Sunday for the ladies’ 9-ball title. 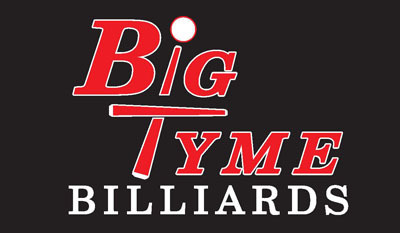 Ricki Casper, Natalie Esparza, and WPBA Players Liz Lovely, and the “Texas Tornado” Vivian Villiarreal reached the winners’ side final four. Casper defeated Linda Garza and Belinda Lee, and Esparza bested Taniya Chuites and Veronica Perez. Lovely ousted Amanda Rikeman and Sara Miller, and the “Texas Tornado” overcame Sam Siegal and Rebecca Arcangeli. After a second round loss to Arcangeli, new mommy and wife of James Davis, Jr., Emma Davis, won an incredible 4 consecutive matches while WPBA Player Sara Miller made her stand with wins over Sheri Palma, 5-3, and Arcangeli, 5-0. On the east side, Esparza squeaked by Casper, 7-6, and Villarreal overcame Lovely, 7-4. Villarreal captured the hot seat over Esparza, 7-2, as Lovely eliminated Davis, 5-0, and Miller struck down Casper, 5-2. Lovely went on to defeat Miller, 5-3, and Esparza, 5-2, for a rematch with Villarreal. The first set was all Lovely as she became the first player to beat Villarreal, winning the first set of the finals, 7-4. The second set was a different story as Villarreal coasted to a 5-3 win, taking down another Space City Open Women’s 9-Ball Division title. For more information about the Space City Open, visit www.facebook.com/SpaceCityOpen.